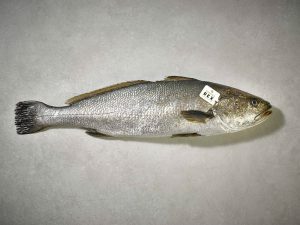 Corvina REX has become part of the references -more than five hundred- that the EROSKI cooperative markets under its “EROSKI Natur” brand. A selection of products made up of fish, meat, fruit and vegetables, among others, which have much more in common than their quality of freshness. The commitment to health and sustainability is an inherent value of the brand and that is why EROSKI also demands it from the suppliers involved. Thus, in addition to its distinctive flavour, its production respectful with the environment, which is guaranteed by the corresponding certificates, is necessary. Frescamar Alimentación and its flagship product, Corvina REX Frescamar, perfectly embody the spirit of the cooperative and its brand “EROSKI Natur” and share its philosophy. EROSKI was the first Spanish distribution chain and the second in the world to pass the chain of custody audit related to aquaculture certified by Global G.A.P. Thus, the “EROSKI Natur” aquaculture species available at its fishmonger´s counters and in its packaged products have the GGN seal (GLOBALG.A.P. Number). A seal that certifies that they have been produced in a manner that respects the environment and animal welfare and under appropriate working conditions. It is the main standard in good agricultural practices of international scope that covers the entire production process, and under which, Andromeda Group (to which Frescamar Alimentación belongs) is also certified. The aquaculture company has also the ISO 22000, ISO 14001 and ISO 9001 certifications with which it guarantees food safety, the efficient use of natural resources, the optimal handling and disposal of waste and, of course, the quality of products as Corvina REX. Among the most recent certifications obtained by Frescamar Alimentación are those related to the British Retail Consortium (BRC) and International Food Standard (IFS), two important internationally recognized quality and food safety standards. In addition to this, in 2015 the strong commitment of the aquaculture group to the conservation of the marine habitat made it worthy of the Friend of the Sea international certification and, nationally, Corvina REX and other species marketed by Frescamar began to bear the seal “Crianza de Nuestros Mares”, guarantor of its national origin and of maximum freshness and quality. The “EROSKI Natur” brand, together with the commitment to sustainability and health, requires producers to obtain a distinctive flavour like the one that Corvina REX is able to offer to the most demanding palates. International awards such as the Superior Taste Award (awarded by the International Taste & Quality Institute) led Corvina REX to become the first fresh fish product to receive this recognition based on organoleptic parameters such as flavour, aroma or texture. In 2016 REX obtained the highest rating – three stars – that recognized the product as “Exceptional”. Furthermore, with Saveur de l´Année 2018 came a new recognition to its taste through the only quality certification for the food sector based exclusively on the taste qualities and in which the “judges” are the consumers themselves.